Goldman Sachs is a lot of things to a lot of people. The Wall Street firm is certainly not without controversy. But one thing critics and fans alike will admit about Goldman Sachs is that the firm has insider knowledge of the Federal Reserve. That’s because for years there has been a revolving door between Goldman Sachs and the Treasury Department. Employees go back and forth between the Wall Street firm and government service at the Treasury Department in general and the Federal Reserve in particular. That’s why when Goldman Sachs makes a statement about Federal Reserve monetary policy, investors need to listen carefully. This week Goldman Sachs has issued an advisory forecasting that the Federal Reserve will soon resume an accommodative monetary policy designed to spur economic activity. The method Goldman Sachs says the Fed will use to do this will be to go out in the open market and buy US Treasuries as well as US mortgage-backed securities, such as bonds issues by GNMA, FNMA and Freddie Mac. The idea is to inject cash into the economy and attempt to keep interest rates on Treasury and mortgage-backed issues down. It is a theory that looks good on paper, but one which has not really worked all that well in practice. The Fed has been priming its money pump over and over for some time now and yet the US economy has remained anemic. These types of monetary policy moves are much more likely to undermine the value of the US dollar and create new bubbles than they are to actually stimulate real economic activity. The world is already awash in dollars. Adding more dollars at this point should meet squarely with the law of diminishing returns. All injecting more dollars into the system will do at this point is further undermine the value of the existing dollars. It is simple supply and demand at work. If the supply of an item is increased with no corresponding increase in demand for that item, the value of that item falls. And make no mistake, there is no increasing demand for dollars. If there was, the Fed wouldn’t have to go out on the open market and buy US Treasuries in the first place. If demand for US Treasuries was already robust, the Fed would be seeking other means to stimulate economic activity. But the real play here is gold. Because gold will not only benefit from the low interest rate policies over the short-term, but, unlike stocks, will also benefit from the undermining of our dollar over the long-term. Gold serves as a counterweight to the US dollar because the US dollar is the world’s reserve currency of choice and also because gold is priced in dollars. Any decrease in the value of the dollar is usually met with an increase in the price of gold. This week, at least according to Goldman Sachs, the Federal Reserve is planting the seeds for rising gold prices down the road. Get your gold now while the price is still low. Ed Butowsky has an important article over on the Fox Business web site about a phenomenon that investors should be concerned about: Stagflation. Butowsky is one of America’s foremost wealth managers. He only provides services for the top 1% of Americans in terms of assets and income. He counts among his clients some of the wealthiest professional athletes in America. Now some background on the topic of Butowsky’s article: Stagflation is the combination of a rising cost of living and stagnant economic growth. It was a term introduced in the 1970s when the phenomenon first appeared. The most important thing to know about stagflation is that it is terrible for stocks and bonds and very good for hard assets. 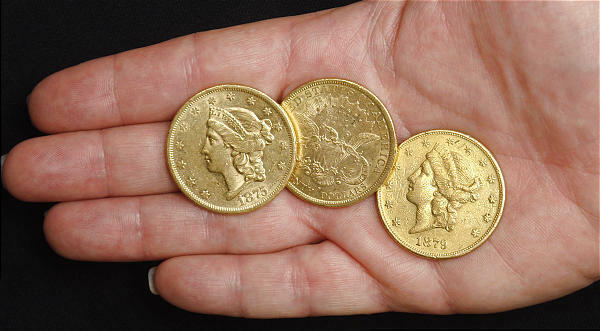 During the stagflation of the 1970s, the S&P 500 fell 45%, while the price of gold tripled, sending rare gold coins even higher. How Do You Spell “PANIC” in Greek? This Sunday Greek voters will go to the polls to decide the economic and financial future of their country. Or so they think. Their economic and financial future was already decided for them long ago with misguided, irresponsible fiscal policies which have placed their country upside down and deeply underwater in debt. That’s why Greece has been the focal point of the ongoing–and still evolving–crisis in Europe for several months now. There is a real fear that Greece could exit the euro, the common currency of the European Union, and send the region into true economic financial and even political chaos. In response, should Greece take that step, the European Union is planning on closing its borders, cutting off money flows into Greece and even limiting ATM withdrawals in Europe to prevent a stampede of assets out of European banks. These types of draconian policies are just the kinds of things that undermine public confidence in banks and other financial institutions–not to mention governments. It’s the stuff crisis is made of. It is naive to believe that this crisis can be limited to Greece, or even contained in Europe. There is too much counterparty risk between banks and other institutions around the world. The Domino Effect is alive and well in the financial markets. Gold is the best protection.